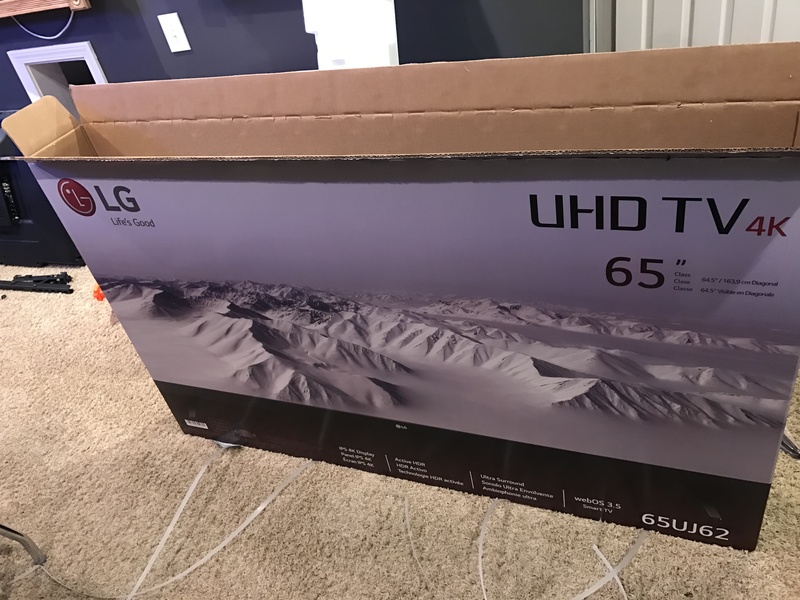 When you first open the box, the first thing you notice is how light the TV is. You expect a TV that large to be pretty heavy but honestly it was pretty easy to lift with a second person. Out of the box it comes with the stand, remote, and manual, pretty standard for most TV’s. What was a little different than most TV’s I’ve bought though is, it came with the mounting screws for hanging on a mount, which is really nice. Too many times I’ve bought a flat screen only to have to go to the hardware store to get wall mount screws for the odd size it has on the back. I used something just like this on mine, it would have been impossible for me to use that back port without it (the cable would have hit the back wall). If you’re not wall mounting, you shouldn’t need it. With a wall mount though, I don’t know how you’d use that port without it. The next question is, how does it look in action? In my eyes, superb. 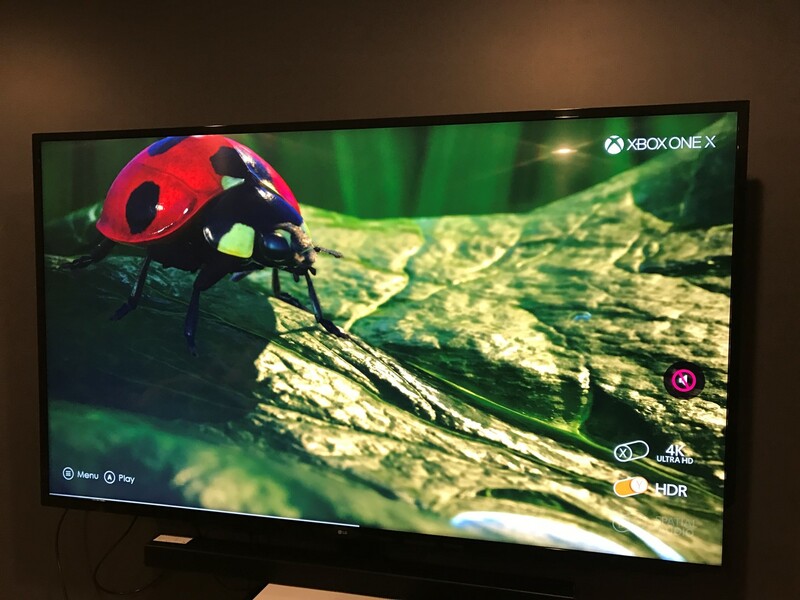 If you’re an AV nut you’re probably going with an OLED TV or some other really expensive TV, but in my opinion you’re better off waiting until that cost goes down and instead getting a TV like this for 1/3 of the price. Two of the biggest features of TV’s today are 4k and HDR. 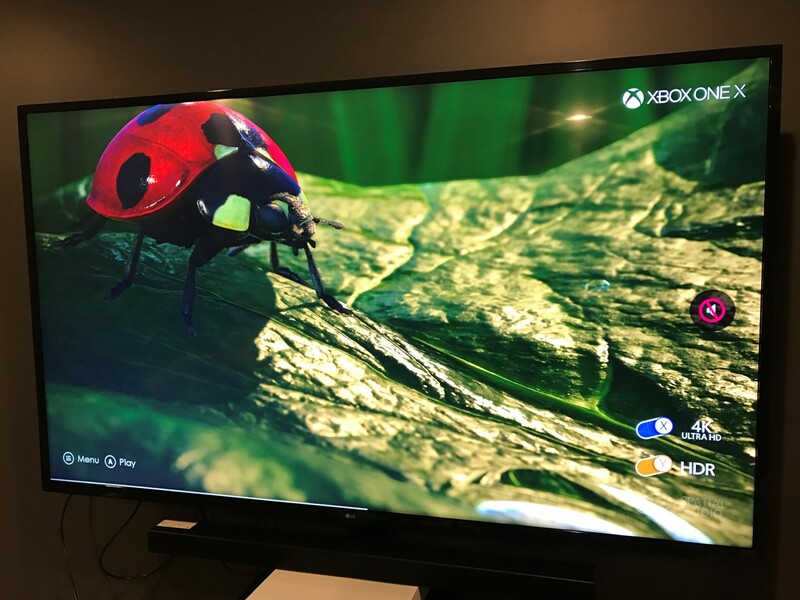 4k simply refers to the resolution of the TV, in this case it refers to the number of horizontal pixels on the screen. I’m not sure why they moved from counting the horizontal lines (1080p) to pixels, I think it was mainly just a marketing thing. HDR, or High Dynamic Range, is basically a new standard for increased color range. Depending on the source material, it can either be awesome or underwhelming. 4k is kind of the same way, depending on how far away you sit from the TV and what your source material is, it can either look fantastic or unnoticeable. 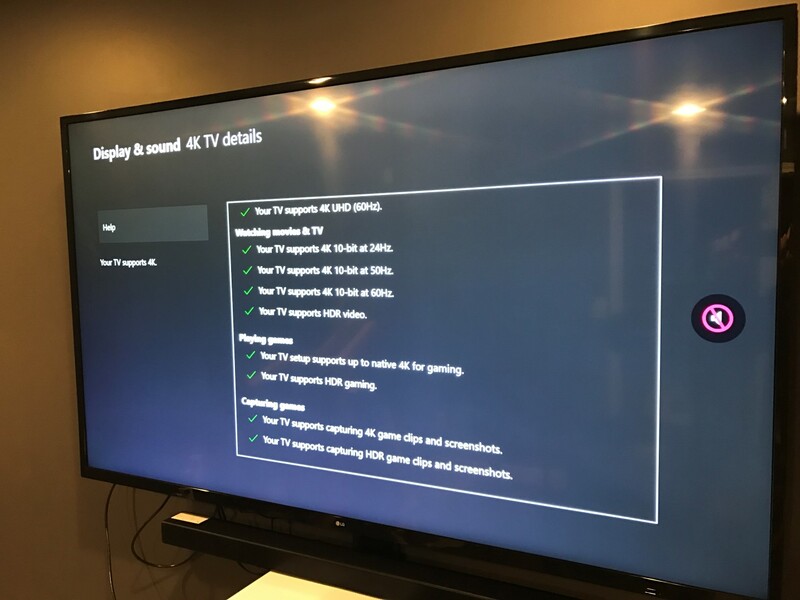 Unlike my Epson 5040ub projector, the LG UJ6200 checks all the marks on the Xbox One X TV information screen (show below). It supports all the latest high tech modes you’d need. Basically proves you don’t have to spend $2000 to get all the latest bells and whistles. 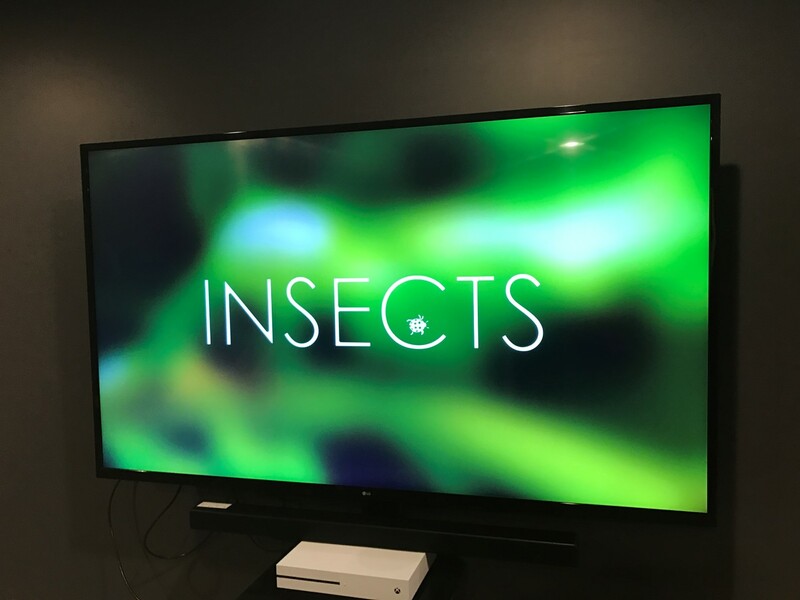 First things I’ve got below are screenshots of the insects demo on the Xbox One X. The first screenshot shows the UJ6200 with 4k and HDR turned off. The second one shows the TV with 4k turned on but HDR turned off. The third one shows 4k turned off and HDR turned on. The fourth one shows 4k and HDR turned on together. I also did a video which shows everything above, it makes it a little easier to see. I’m very happy with the sound bar and would recommend that anyone buying a TV today invest in one. Speakers today in TV’s just can’t output the sound they need to in the space they’re allocated. This Samsung is nice in the fact that you can add wireless rear speakers onto it later if desired. I’ve actually done just that and will be reporting on the results here pretty soon. Included on the TV is WEBOS 3.5, which basically allows you to access Netflix, Amazon Prime, Hulu, and other streaming services. The apps work really well on the TV, it’s now the third TV I own that has had LG WEBOS on it and it has worked really well for me in the past. The only drawback is that it’s not as supported as something like Roku, so things like NBA League pass can’t stream through it. That’s a pretty fringe case though, and most things will work really well. Differences between UJ6200 and UJ6300? There is almost no difference between the UJ6200 and the UJ6300, the only visible difference is that the backs are slightly different. Feature wise they are identical. This has caused a lot of confusion among consumers I think because usually higher model numbers specify added features but not in this case. Hopefully this review has helped out. 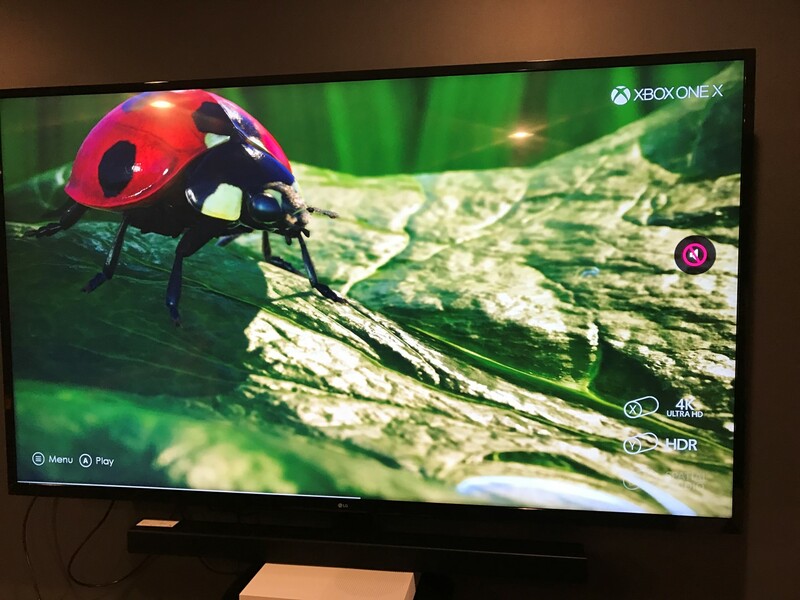 There usually aren’t many reviews when the TV’s are this new, so knowing that it supports the Xbox One X fully should help some of you out. The LG 65UJ6200 is an outstanding value for the price in my opinion. If you’re looking for a 4k Blu Ray player to go with it, I would suggest either the Xbox One S or the Sony UBP-X800, which is considered best overall value currently in that space. I’ve linked to them below in case you’re interested.